Garden owners know the importance of owning an efficient leaf blower. Just one leaf blower far outweighs several rakes. Two hours of raking can effectively be replaced by less than 30minutes of leaf blowing yet still clearing the same area. To clear debris from a large piece of garden, gas leaf blowers are ideal. An electric corded leaf blower will limit your radius of operation to the length of the code. 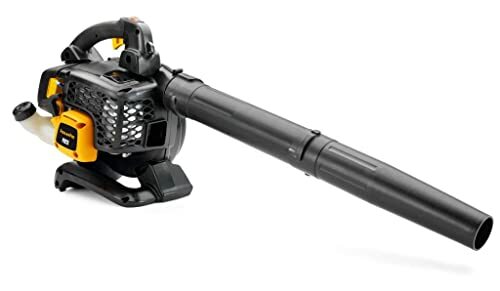 Cordless but chargeable blowers will require frequent charging. That’s where the gas leaf blower thrives. Simply fuel your blower and it’s done. No annoying cords. One such powerful handheld gas leaf blower is the Poulan Pro PRB26. Owing to its size and design, the Poulan Pro PRB26 finds many uses as a garden tool. During the fall, many dry leaves will litter your yard. The Poulan Pro PRB26 will help you to quickly clear off such grass and leaves. Even when you need to clear your driveways from, light snow and debris, the gas leaf blower does it effectively. Worried about littered sandy decks and patio? Worry less because the Poulan leaf blower will clean it efficiently. Even the stubborn debris won’t stand in his way! So what are the outstanding features that make it ideal for such uses? Small but a powerful engine; the gas blower employs the 26 cc two-stroke engine. That gives it the ability to pump out air at a sizzling speed of 200 mph with 470 CFM. That makes it ideal for clearing large gardens in fewer minutes. Portable; as its name suggests the leaf blower is handheld. It gives you an easy time to carry it with one hand as you clear snow, grass and leaves from your lawn and driveways. It’s very convenient since it has no dangling cords. Comfortable handle; the soft and comfortable handle gives you a calm feeling when using the blower for a protracted period. At the same time, it ensures that you have a good grip on the garden tool, thus limiting accidental droppings of the blower. Variable speed; the adjustable speed comes in handy when you want to clean larger lawns. Besides, when you come across stubborn debris, the variable speed comes to your rescue to finish off the work quickly. Lightweight design; the garden tool measures 15 x 16.5 x 12 inches and weighs 11lbs. The lightweight means less fatigue after the leaf blowing exercise. Reduced vibrations; nothing tires and annoys like the excessive vibrations of a blower. Fortunately, the Poulan Pro PRB26 employs the reduced vibration technique. That gives you the comfortable blowing experience. Versatile use; the garden tool has many alternative uses. For example, it can clear off light snow from the driveways, dry leaves, and debris from the lawn, cleaning your sandy deck and patio, drying your car after washing it and dusting the dirty tools in the garage. Simple to use; the blower is easy to assemble and straightforward to use. Moreover, after finishing your cleaning, it’s easy to store since it occupies less space. 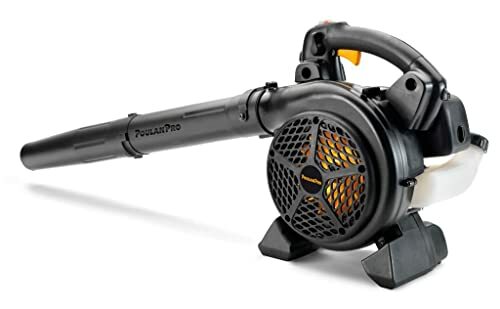 The Poulan Pro PRB26 is a lightweight, portable leaf blower, with the flexibility of use. Besides, it is its simplicity of use, variable speed and outstanding performance that makes it adorable for many users.